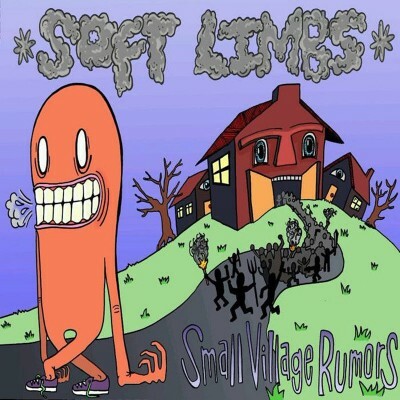 Small Village Rumors, the third release in local band Soft Limbs’ discography, chronicles the lifespan of a sect of rumors that pan out across the landscape of a small town. The opening track, “Poketz,” travels through a diverse system of instrumentation involving cascading guitars, singer Alex Duran‘s weighty, Ian Curtis–influenced vocals and a pad lead from a synthesizer that coruscates into grungy, garage rock territory. Duran’s vocals provide an anger of cynical romanticism for the album as he sings, “I can go wherever it is you want to go / We can go wherever it is you want to go.” It’s a premonition of the album’s bittersweet and emotive narrative, supplemented by Curtis Pettygrove‘s abruptly dynamic drumming style. The album quickly dips into more psychedelic territory with the track “Tide Up,” a crunchy, detached anthem defined by its dynamic refrains and abrupt harmony shifts. Duran’s vocals emote a moment of apathy as he chronicles in folk-singer likeness, “Lying in my bed / Smoking cigarettes / Listening to Mac DeMarco.” It’s a complementary addition to Pettygrove’s drumming, which narrates through a black hole of speed and dynamism ultimately headed for cathartic entropy.